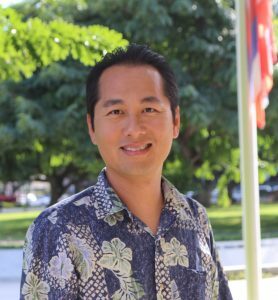 HONOLULU — Windward Oahu resident Vincent Hoang has joined the Office of Enterprise Technology Services (ETS) as the State of Hawaii’s chief information security officer (CISO), a position approved by the Legislature in 2016. In place since Dec. 1, Hoang is responsible for establishing cybersecurity standards for the executive branch and ensuring that system operations stay current with best practices. The 2016 Legislature’s approval of three new cybersecurity positions will help further build the state employee-led cybersecurity program, which protects all three branches of government that today share a common access point to the Internet. In addition to the CISO, who will report to the CIO, two cybersecurity support positions will assist departments in further securing their endpoints and proactively searching for vulnerabilities in the state government network. The focus of existing staff thus far has been on perimeter security, and the next phase is building end-point security platforms. Hoang brings 20 years’ experience in developing and implementing effective information technology strategies, including the application of cybersecurity, network management, and systems design to improve business outcomes. Hoang most recently served as the enterprise architect for Hawaiian Telcom, where he secured infrastructure for customers and conducted network architecture, performance, security risk, and systems infrastructure assessments. He also worked as a senior systems consultant for Bank of Hawaii and a security engineer for Munger, Tolles and Olson in Los Angeles. Prior to that, he worked as a technical support manager for TD Technology Services, network performance and systems engineer with Cable and Wireless America in Honolulu, and senior systems administrator for NetSuite in San Mateo, Calif.
Hoang earned a bachelor of science from the University of California, Riverside, and holds a wide variety of technical competencies. He is a Certified Information Systems Security Professional (CISSP), Global Information Assurance Certification (GIAC) Systems and Network Auditor (GSNA), Certified Information Security Manager (CISM) and Systems Auditor (CISA), Cisco Certified Design Professional (CCDP) and Associate (CCDA), and Cisco Certified Network Professional (CCNP) and Associate (CCNA). Actively involved in the local tech community, Hoang is a past president and IT sector chief of the InfraGard Honolulu Members Alliance. He participated in the Po‘oihe Cyber Security Exercise as a Red Team lead from 2014 to 2016, assessed entrants in the At-Large Collegiate Cyber Defense Competition as a White Team judge in 2015 and 2016, and served as a mentor in the Air Force Association’s CyberPatriot Program in 2011 and 2015. He also contributed as a Tech View columnist in the Honolulu Star-Advertiser. The Office of Enterprise Technology Services (ETS) was formally established by Act 58, Session Laws of Hawaii 2016, which consolidated two information management and technology programs. Led by the chief information officer of the State of Hawaii, ETS provides governance for executive branch IT projects and seeks to identify, prioritize and advance innovative initiatives with the greatest potential to increase efficiency, reduce waste, and improve transparency and accountability in state government. ETS also supports the management and operation of state agencies by providing effective, efficient, coordinated and cost-beneficial computer and telecommunication services such that state program objectives may be achieved.